My latest PopMatters article is now live: A Reign of Missiles and Conflict Narratives. I should really talk about the intersection of game design and international politics more often, this stuff is fascinating. I was lucky enough to get my MA at a University that embraced such unique combination of concepts and ideas and, frankly, I miss jumping wholeheartedly into the two fields simultaneously. The Reign of Missiles board game is hilariously perfect to pique my interest. 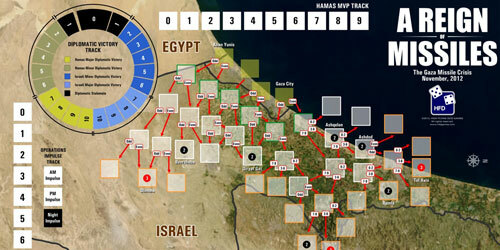 A game about Israel and Palestine conflict? What's not to love? The board game, designed by Paul Rohrbaugh, holds far more depth than my article could thoroughly explore, at least within any reasonable length. There are loads of various interesting systems that reflect particularly perceptions and narratives related to the ongoing conflict. Israel, for example, potentially has access to airborne Commandos that can attack up to two targets in the Gaza area. These special units still have the same chance of inflicting civilian casualties when attacking. The chances of administering civilian casualties, 60% for both sides, is relatively high, particularly for a small band of ground troops. The frequency of such casualties depict a consistency in fatalities in both sides, regardless of motivation and engagement. Depending on your political perspective, this could be interpreted as a harsh reality or a gross over exaggeration. A Reign of Missiles joins of many games about real-world conflict and a wider genre of war simulators. As such, there seems to be a clear pursuit of objectivity in the rules here. Of course such goals are impossible to achieve. That being said, A Reign of Missiles is complex enough to offer multiple perspectives on the conflict. As a piece of participatory folklore, the stories this game, and others like, can tell, is incredibly educational.